Blog Pay KW Eden no more than R145k. Keep the rest! Pay KW Eden no more than R145k. Keep the rest! Although estate agents join agencies for many reasons, the commission split offered by an agency certainly ranks as one of the most important considerations. Some traditional agencies offer 50/50 splits, especially to rookie agents, but this model is under increasing pressure from modern agencies. Nowadays its quite common to find agencies that offer much higher splits to their agencies such as 70/30 or even 80/20. Unsurprisingly, they are very popular among agents. The property business can be quite demanding, and agents obviously have to hold on to as much of their commission income as possible. Keller Williams prides itself as being the most agent-centric estate agency in existence. Thanks to our innovative growth and volume business model, KW associates all start out on a very attractive 70/30-split. However, once a KW Eden associate has paid (split) a maximum amount of R145,000 per year to the agency out of her sales commission, she “caps”. All of the commission (after royalties) from her sales the rest of that year is hers alone. For example: Let's imagine that Suzi joins Keller Williams Eden in George (Garden Route) in November this year. She gets her listings on the Keller Williams Listing System during November and lands her first transaction with a gross commission income (GCI) after royalties of R100,000 at the end of that month. She gets R70,000 and splits R30,000 to KW Eden. If she does transactions with a total GCI of only R483,333 before the end of October next year, she gets to keep the full commission after royalties on all the transactions before her year anniversary. How many transactions does Suzi need to do during that year to become a capper? Well, let's say the average property sold by Suzi fetches a purchase price of R1,5m and she works at an average commission rate of 6% per sale. Her average commission per sale would amount to R90,000 (or R82,800 after royalties) of which she keeps R57,960 and splits R24,840 with KW Eden. Because she caps after paying an amount of only R145,000 per year to KW Eden, it means she only has to sell 6 (5,8 to be precise) of her averagely priced properties at 6% to cap. The rest of that year she will get to keep all the commission (GCI after royalties) on all her sales. 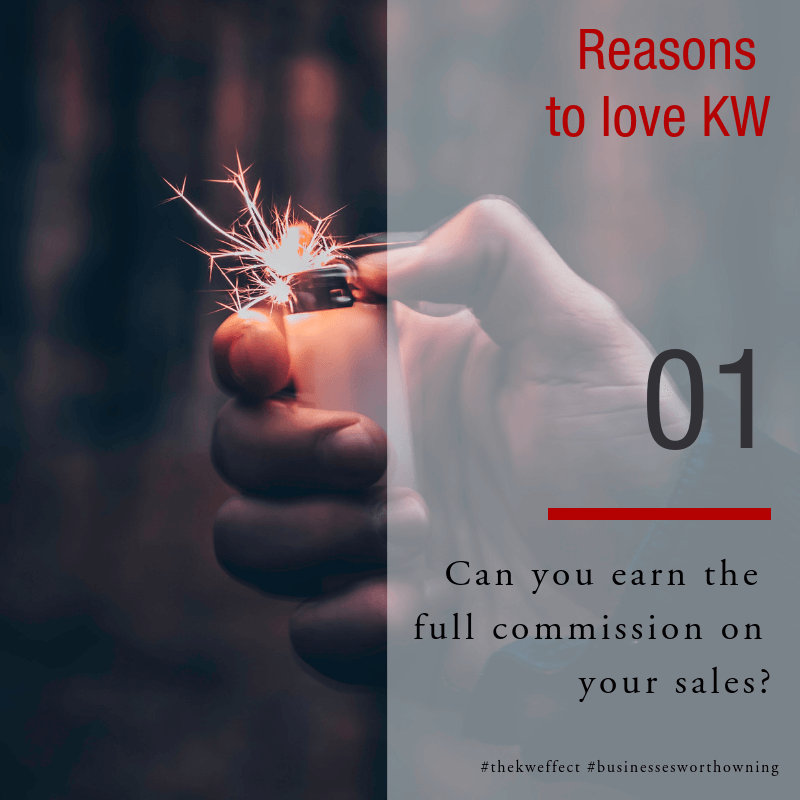 In short, associates of KW Eden in the Garden Route can become 100% commission earners in any year! Of course, deciding on which agency to join depends on many more considerations than merely the commission split. Other considerations such as the support, training, coaching, technology and wealth-building opportunities offered by your estate agency are just as important, if not more. For more information and guidance in this regard, consider these 5 questions that any estate agent must ask his or her estate agency. The question is, do you currently have the potential to keep the full commission on your transactions where you are now? If not, isn't it time you give yourself a raise? To compare the KW Eden financial benefit with your current agency, click here. Click here to schedule a confidential business consultation with our Team Leader.